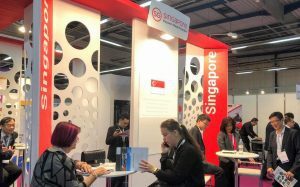 With the support of Enterprise Singapore, AAIS mounted a business mission and Singapore Pavilion at Aeromart Toulouse 2018 from 4 to 6 December 2018. With an eye-catching setup, the Singapore Pavilion at Hall 6 E36 saw a good amount of traffic. Participants enjoyed three great days of meeting potential customers and partners, as well as a high-level conference with topics on innovation, supply chain and procurement policies of large OEMs. “Aeromart is a very good platform for getting business opportunities as well as business contacts. I appreciate the effort from AAIS and ESG for organising this event for Singapore companies. Good job!” – Mr Ang Yong Kang, Marketing Lead, Singapore Aerospace Manufacturing.